The Revised Memorandum of Understanding on the establishment of WCO Regional Training Center in the People’s Republic of China was signed on 6th July 2017 between the WCO Secretary, General Mr. Kunio Mikuriya and Minister of GACC, Mr. Yu Guangzhou on the sidelines of the Council Sessions held in Brussels, Belgium. Recognizing the important role and the significant potential of the People’s Republic of China in supporting the WCO in its efforts to provide assistance to WCO Members, besides the Shanghai Customs College, today the revised MOU also covers the Customs Training Centre in Xiamen which is another example of the value attached to regional WCO bodies. Vice Minister of GACC Mr. Wang Lingjun, representative of WCO Secretariat, local government officials and representative of BRICS’s member country attended the inauguration ceremony. During the opening remarks, Vice Minister Mr.Wang Lingjun highlighted the importance of training in Customs’ work in general and pointed out that the Center will keep building up its capacity in line with international standards so as to rank among world-class customs training centers and provide excellent training services to the WCO Asia Pacific Region Members. 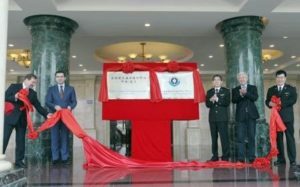 Customs Training Centre in Xiamen will also be functioning as BRICS Customs Training Center (Xiamen).